Temporary Culture, [3 May] 2010. 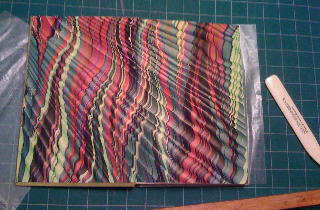 Sewn onto linen tapes and bound in iridescent sooty red Japanese cloth with Ann Muir marbled endsheets, signed by Ellen Kushner and with the folding plate signed by the artist. 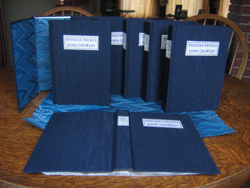 10 copies, numbered i to x, for presentation ; 11 copies, numbered 1 to 11 ; one unnumbered copy, bound untrimmed as trial binding. 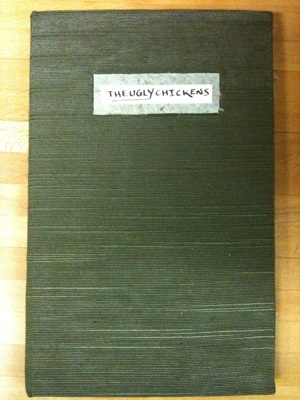 Old Earth Books, [October,] 2009. Bound July 2010. Temporary Culture, [31 October,] 2008. 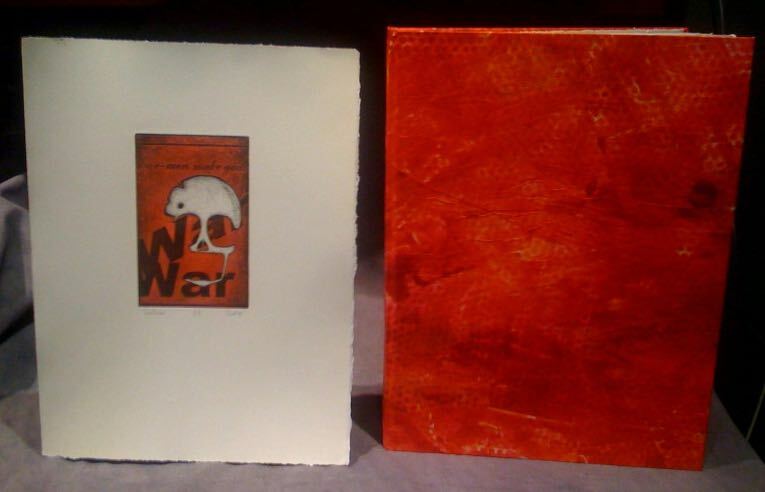 30 copies on fine paper, letterpress printed by David Wolfe, with aquatint etchings printed by the artist from the original plates (two with added color), numbered & signed by the artist in pencil, hand bound in orange-red paste paper over boards. 25 copies, numbered 1 to 25, signed by the artist and author ; and five copies lettered A - E (reserved for the artist, author, and printer). 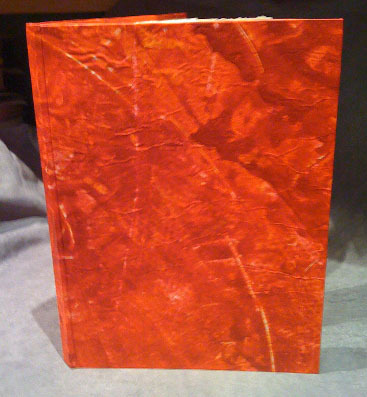 Advance copy, all proofs, trial binding, in rose-red paste paper over boards, exhibited at Readercon 19 (July 2008). 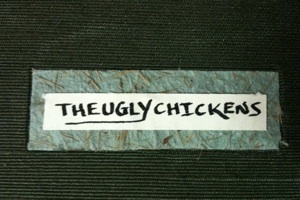 Temporary Culture, [10 July,] 2009. 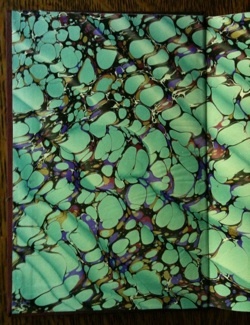 Sewn onto linen tapes and bound in Asahi book cloth over boards, Ann Muir marbled endsheets, signed by Michael Swanwick and Neil Gaiman, with frontispiece illustration signed by Charles Vess. 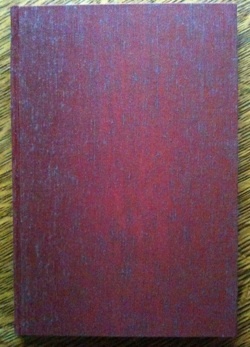 5 copies for presentation, bound in iridescent plum silk, numbered A - E ; one unnumbered copy, hors série. 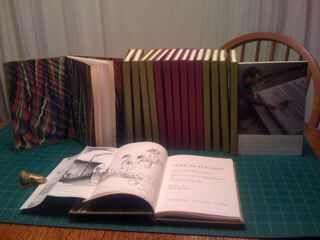 25 copies bound in chartreuse cloth, numbered 1 - 25 ; one unnumbered copy, hors série. Small Beer Press, [1 May,] 2007. 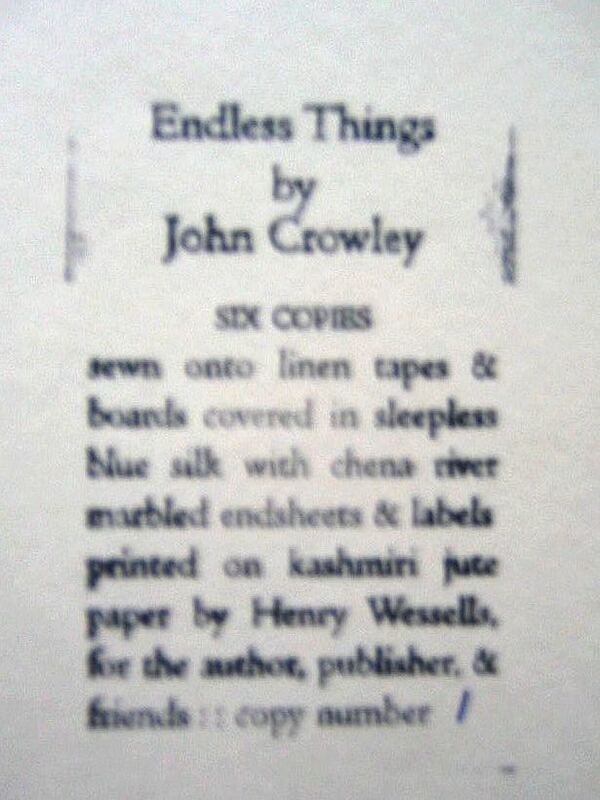 Sewn onto linen tapes and bound in sleepless blue silk over boards, spine and front cover labels printed on kashmiri jut paper, chena river marbled endsheets. 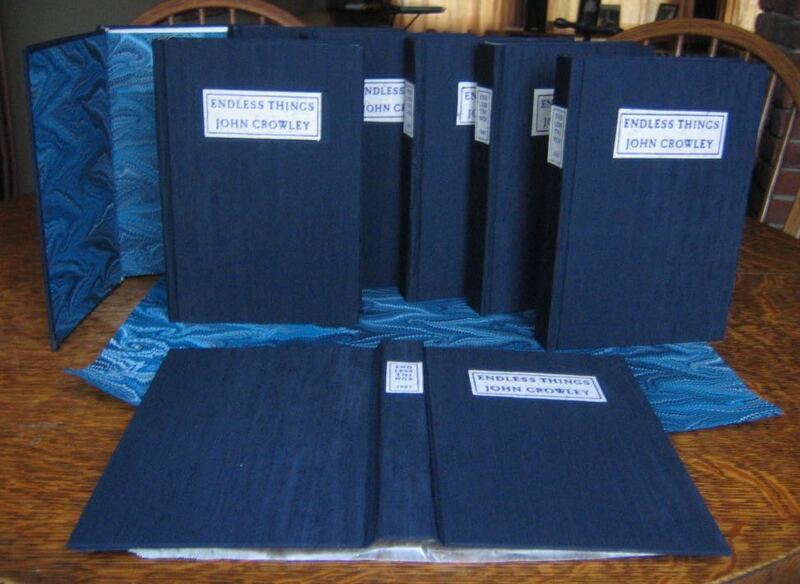 Edition of 6 copies, signed by the author, numbered 1 - 6 , for presentation only ; (trial binding, numbered 0 and inscribed by the author to the binder). Limitation page. Temporary Culture, [31 October,] 2006. 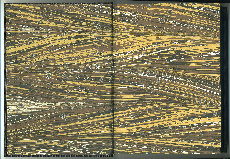 Sewn onto linen tapes and bound in black silk over boards, with a wood block print onlay to front cover, Ann Muir marbled endsheets. 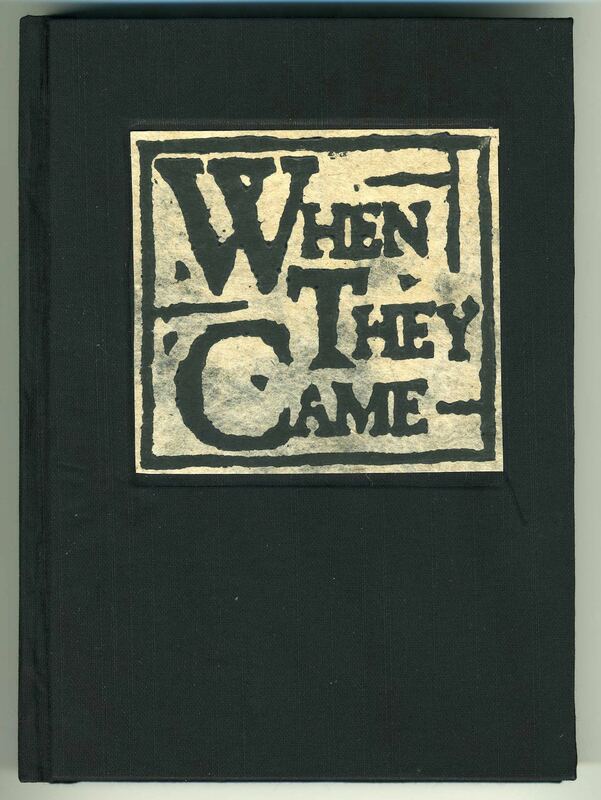 15 copies, signed by the author, numbered 1 - 15 ; three unnumbered copies, signed by the author, hors série. The Nutmeg Point District Mail, [30 June,] 2000. 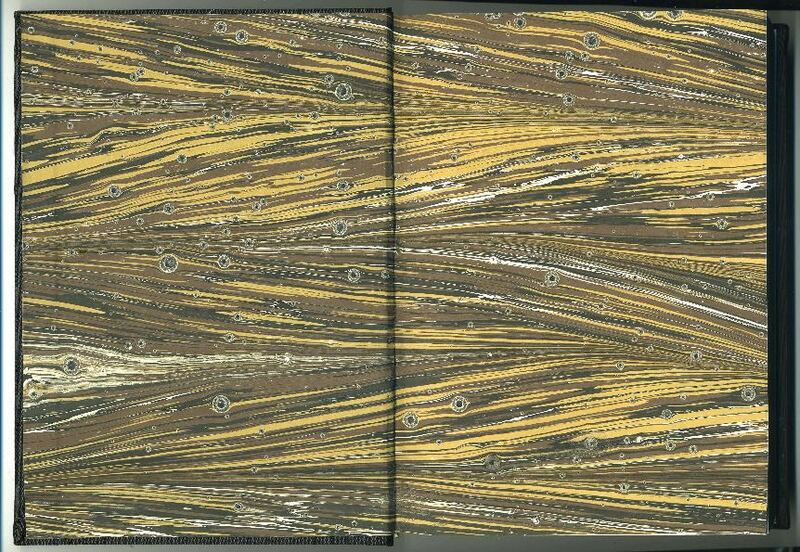 Sewn onto linen tapes and bound in green Dutch linen and handmade Indian jute paper (Alexandra Soteriou’s Desert Grass) over boards, title and vilvoy in gilt, Desert Gold endpapers. Presentation issue of 25 copies, numbered i - xxv ; trade issue of 25 copies, numbered 1 - 25. 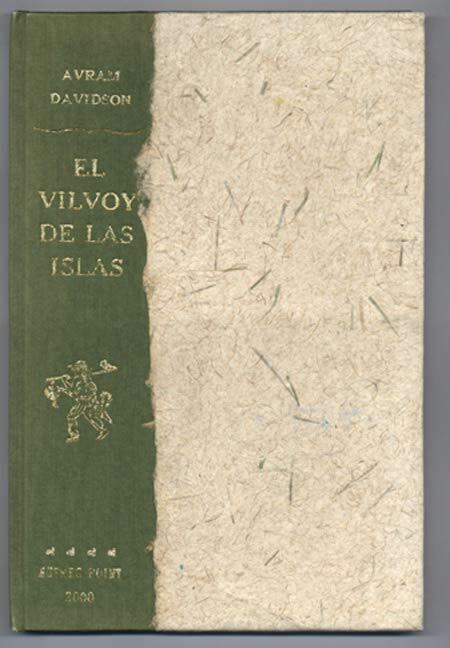 (With) Test binding (detail) of El Vilvoy de las Islas in blue linen and Kashmiri jute cloth paper, two copies hors commerce. Puck Aleshire’s Abecedary by Michael Swanwick. Illustrated by Kathryn Kramer. Sewn onto linen tapes and bound in quarter brown Dutch linen and handmade Indian jute paper (Alexandra Soteriou’s Desert Gold) over boards, Desert Gold endpapers. Trade issue of 30 copies, lettered A - Z & North, South, East, West, and signed by the author ; presentation issue of 14 unnumbered copies, signed by author and illustrator.